Wilson Hall is a residence hall for men equipped with fully-furnished rooms and private baths. Nicholas Hall is a residence hall for men equipped with fully-furnished rooms and semi-private baths. Cash Hall is another facility for men with fully-furnished rooms with semi-private baths. Butler Hall, honor housing for men, has fully-furnished private rooms with living areas and semi-private baths. Southerland is a residence hall for women equipped with fully-furnished rooms and semi-private baths. Shell is a residence hall for women equipped with fully-furnished rooms, semi-private toilet facilities and showers on the hall. Belle is a residence hall for women equipped with fully-furnished rooms and semi-private baths. Southerland Apartments is honor housing for women, with fully-furnished two or three bedrooms, living area and bath. All unmarried, full-time students who do not live with immediate family are required to live in the residence halls. Students requesting authorization to commute must complete an online Commuter Approval Form, verifying their residential status. This authorization must be renewed each semester. Have a cumulative GPA of 3.00 or above. Students who fail to comply with this requirement are subject to dismissal from the College. For additional information or questions regarding this policy, contact the Dean of Students at (870) 759-4188. Details on residence life are provided in the residence life section of the Student Handbook. Residence Hall activities and parties are held throughout the semester for all residents. A $125 fee per semester is collected from each resident student. This fee helps pay for residence hall activities. The residence contract period begins the first day of the semester and ends for students at 6:00 p.m. the day of their last final examination. (Items left on the premises at the termination of this contract become property of Williams Baptist University—with the exception of students returning for the spring semester, who may leave personal items in their rooms.) All residents will be expected to vacate the residence hall by 6:00 p.m. on the day holidays begin. Residents staying in the residence hall before openings and after closings must obtain permission from the resident director. There will be a $50 charge per night unless students are staying at the request of Williams Baptist University. May 4: Close at 2:00 p.m.
Why Should Students Live On Campus? On-campus living at WBU provides a great living and learning experience. Students can experience living next to an individual from a different culture, a different section of America, or even a different country. Living in the residence halls plays an important role in students’ growth as they become part of the academic community at WBU. Also, studies show that students who live on campus tend to make better grades. 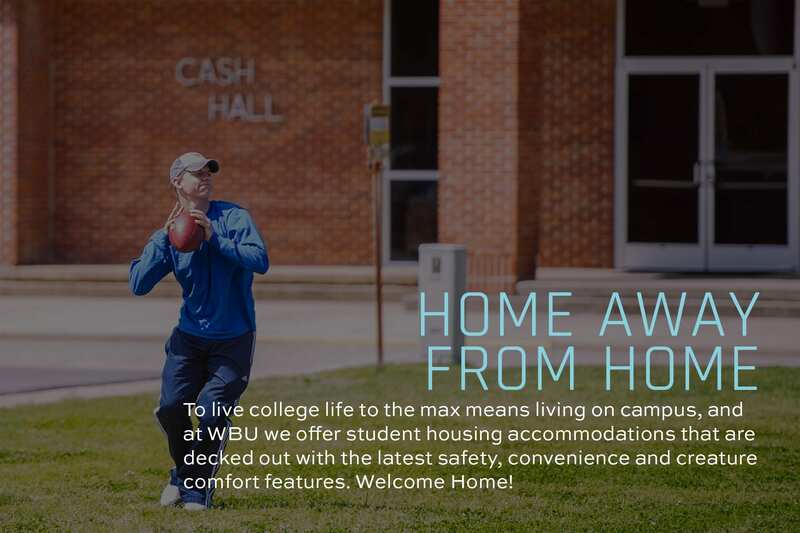 Reasons for this may include being closer to the library and the computer lab, or the fact that residence life is more conducive to studying than off-campus housing. An RA (Resident Assistant) is a part of the Residence Hall staff. Each residence hall has a well-trained staff consisting of a Resident Director and Resident Assistants. The Resident Director is responsible for total supervision, counsel, direction, and activities in the residence hall. The RAs provide assistance in the halls, the lobby, and the cafeteria. Room assignments are made by the Residence Hall Directors. Every effort is made to honor requests for rooms and roommates. Assignments are sent out in early July. What Does the College Provide in Each Room? Due to fire safety codes, cooking in the residence hall rooms is restricted. (Coffee pots, candle warmers, and hot pots are allowed.) Two microwaves are provided in the private lobbies of the women’s residence hall. A microwave is also available in the private lobby of Cash and Wilson Hall. Microwaves are allowed in the kitchens of Butler and Southerland Hall apartments. No incendiary (flame or explosion producing) devices are allowed in the residence halls. What are Measurements on the Windows? Classification * Choose OneI'll be a first time freshman.I'm transferring in.I'm readmitting. The Housing Office cannot guarantee your first choice of residence hall, room or roommate, but requests will be honored when possible. Requests will be processed based upon the date the application was completed, housing deposit receipt, and upon availability of residence hall space. Williams Baptist University has special housing arrangements for families. These eight units are located in the Nicholas West Apartments complex. Each apartment features two bedrooms, a living area, kitchen (with refrigerator & stove), one bathroom with washer/dryer hookups and a handy storage room. Renters pay utilities. Deposit for Nicholas West Apartments is equal to one month’s rent payable in advance at the Office of Student Affairs. Rent is paid on the first of each month in the Business Office in the Swaim Administration Building and is prorated for a partial month’s occupancy. The first month’s rent must be paid at the same time as the deposit. The Tenant Agreement covers occupants of university-owned apartments and is effective on a month to month basis that must be renewed by April 1 of each year. A signed Tenant Agreement is required and indicates acceptance of the terms described below. Requests for release from the tenant agreement must be submitted in writing to the Office of Student Affairs which will constitute a commitment to vacate the unit. Release from the agreement begins the date the unit is vacated as described below. Residents are responsible for knowing and abiding by all campus policies and procedures as stated in the current online catalog and Student Handbook. Failure to comply with any university or housing policy may result in eviction from the housing unit and/or forfeiture of security deposit. Williams Baptist University maintains the right to terminate agreements and to evict residents when it is considered to be in the best interest of the university or university community. Only a currently enrolled student and his/her student related tenants may live in Family Housing. Sub-leasing and assignment of the premises is not permitted. Written authorization for guests of more than two weeks is required. Housing units are residential only and may not be used for commercial business purposes. The possession, use, distribution, and/or manufacture of drugs or alcohol is strictly prohibited on campus and in housing units. The use and possession of guns, look-alike guns, explosives, fireworks, and weapons is strictly forbidden in all housing units. Williams is a tobacco free campus. The use of tobacco, in any form, is prohibited in campus buildings, including Family Student Housing. Residents must notify the Office of Student Affairs if any tenant is charged with a crime. As of September 1, 2014, no pets of any kind (including fish) are allowed in or around the Family Housing units, nor anywhere else on campus. Residents may not paint, make alterations, add ceiling fans or change the housing units in any way. Keys to units may not be copied or loaned to non-residents. Residents are responsible for reporting damages or needed repairs to the Office of Student Affairs. Residents are responsible for damage/loss to the properties that result from anything other than normal use. Williams Baptist University is not responsible for loss or damage to personal property. Residents are encouraged to carry insurance to cover belongings. The University does not guarantee against loss or inconvenience due to failure, disrepair, interruption, or surges in mechanical equipment or utilities. Tenants and visitors may park only on the concrete pads at Family Student Housing. Installation of special hookups for appliances, other than what is already installed, are the responsibility of the student and may not be installed without written permission from the Office of Student Affairs. Sudden Link is the only provider that we allow for cable and/or internet for Family Housing apartments, Sudden Link cables are already installed in the apartments, but you must contact them to have your service connected. Satellite providers are not allowed under any circumstance. No more than 60 watt bulbs are to be used in all light fixtures. The spraying of mosquito repellents and sunscreen are to be done outside the apartment. These products damage wax floor finishes. Residents of campus housing are responsible for maintaining orderly, sanitary conditions inside and around the housing units. Only door and porch décor items may be displayed in front of the apartments. Bicycles, toys, grills, etc must be stored behind the apartments on the concrete pad within the fenced area in the backyard. Boats, trailers, campers and RVs, etc. must be stored in the designated storage area located behind the Physical Plant. The area has security lighting and electrical access. Personal property insurance is encouraged, because the college is not responsible for theft or damage to your property. Before garbage pick-up each Tuesday, residents are to place trashcans by the curb on Mills Street and should return trashcans behind apartments following garbage collection. If trashcans remain curb-side on Thursday morning, a $20 fine will be added to the tenant’s bill in the business office. Large items (appliances, mattresses, etc) can be discarded in the dumpster behind the old maintenance building, Monday through Friday from 8:00 a.m. – 4:00 p.m. Place items beside dumpster and maintenance will lift items into the dumpster. Recommended floor care products: Mr. Clean w/Febreeze, Fabulouso, Mop-N-Glo and Swiffer Wet Jet. Graduating residents of Family Student Housing have 14 days from graduation (or from the last day of exams in the Fall semester) to vacate the housing unit. Students who drop out of school have two weeks from the date drop out is completed to vacate the apartment. Failure to issue a 30 days notice to the Office of Student Affairs before vacating the unit will result in forfeiture of the entire security deposit. The apartment is considered to be vacated when it is empty and all copies of the keys are turned in to the Office of Student Affairs. Failure to return all keys will result in forfeiture of the entire security deposit. Cleaning fines will be charged if the apartment is not cleaned when vacated. One-third of the security deposit is refundable only after the premises are vacated, inspected, charges for damages have been assessed, and all accounts have been cleared, and a formal written refund request has been submitted to the Office of Student Affairs. If a written request is not made within six months of vacating, it will be assumed the refundable deposit is being donated to Williams Baptist University and the money will be placed in the Scholarship Fund. The remaining balance of the security deposit is used for maintenance of the facility in preparation of the new residents. Will you accept any housing at any location? Students must provide a completed Housing Application form and a security deposit for applications to be considered. Housing units are assigned to students on a first-come basis according to the University's housing policy. Neither applications for housing, nor rank on housing waiting lists guarantees a housing assignment. Williams Baptist University maintains the right to refuse housing when it is considered to be in the best interest of the university or university community. I request consideration for Williams Baptist University housing based on the information provided above which is correct to the best of my knowledge. I further understand that a security deposit must accompany this application to validate the request.